A while ago, I realized that even though I'm in college, I still love cooking. Even with my busy schedule, I still make time to make good food. NOTE: Unless otherwise stated, all recipes are for one (1) serving. Seriously, you can whip this out in almost no time. The one day I had thawed out beef and really wanted to cook, but it was already 11:30 pm and I didn't want to stay up too terribly late because I had to be up for class the next morning. It probably only takes about 20 minutes, give or take. Hoisin sauce is a sweet yet spicy sort of Chinese barbecue sauce. It's a soy-based sauce seasoned with vinegar, ginger, chili, and other spices including licorice. Since it's kind of thick, I tend to dilute it down with rice vinegar since it adds more flavor than just plain water. You can pick up ready made hoisin in just about any supermarket that has even a tiny Asian section, since it is quite popular. It makes a great sauce for a quick stir-fry, as you really don't need to add much to it. Mince the shallot and garlic. Heat a little oil in a pan, then add the garlic and shallot. Saute until the garlic has browned slightly and the shallot is softened. Cut the beef into thin slices, then add to the pan. Cook until the beef is no longer raw. Chop the scallions into 1/2 in. pieces on the diagonal, and cut the snow peas in half on the diagonal. Add the vegetables to the pan and stir-fry an additional 1-2 minutes. Mix the hoisin and vinegar together. Add to the pan and stir until everything is coated in the sauce. To serve, place the rice noodles on a plate. Spoon the stir-fry over the noodles and sprinkle with sesame seeds. I actually had chicken thawed out in the fridge, but at the last minute I decided to go against it and have something a little lighter because I wasn't quite as hungry. I failed at that, though, because this turned out to be quite filling. 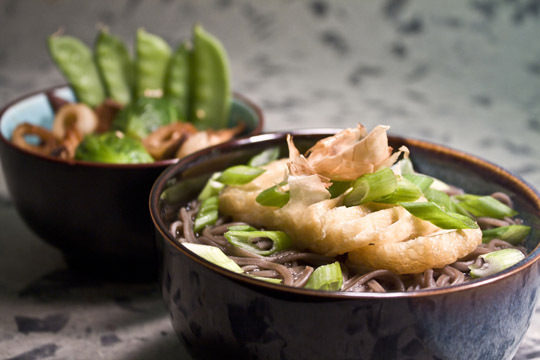 The soba, or Japanese buckwheat noodles, are served in a savory soup and topped with sliced tofu puff, scallions, and a pinch of bonito flakes. For those unacquainted, bonito flakes are very thin shavings of dried skipjack tuna. They're kind of pricey, but you usually only need just a pinch since they have a strong flavor. The blurry stuff in the back is steamed brussel sprouts with teriyaki shiitake and chikuwa, or tube-shaped fish cake. I've had these brussel sprouts in the fridge for a while and they were about to go bad, so I used them up. Surprisingly, none of this is very "heavy" tasting, so if you've eaten a really bad, fatty lunch (like someone I know.... me), you won't feel sick afterwards, and it's very healthy. Cook the soba noodles according to package directions, then drain, rinse with cold water to remove the starches, then drain again. Line a bamboo steamer with parchment paper (or just use a metal steamer basket in a pot with a lid), place the brussel sprouts inside, and place over a pan of water. Bring the water to a boil and steam the sprouts until they are bright green and cooked through. Remove the steamer from the pan, take off the lid to release the excess steam, and drain the water from the pan. Reserve the pan. Cut the brussel sprouts in half top to bottom. 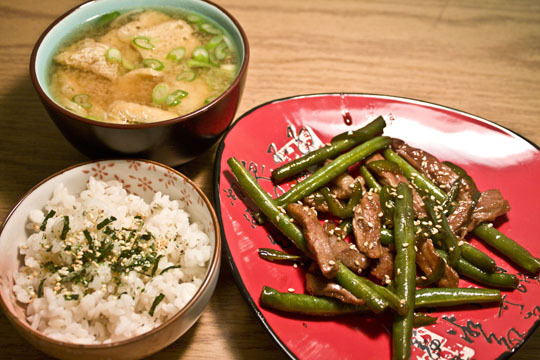 Bring the measured water for the soup to a boil, then add the dashi granules, soy sauce, mirin, and sake. Stir to dissolve the dashi. Cut the shiitake mushrooms into 1/2 in. strips, and the chikuwa into 1/2 in. pieces on the diagonal. Mix the sake, mirin, and soy sauce. Reheat pan you used to steam the brussel sprouts and add the mushrooms, chikuwa, and sauce mixture. The sauce should start to froth. Cook until almost all the liquid has been absorbed, then remove from heat. Cut the tofu puff into thin slices, and chop the scallion into small pieces on the diagonal. To serve, put the soba in a bowl and pour over with soup. Garnish with tofu puff slices, scallion, and bonito flakes. Gently mix the shiitake, chikuwa, and brussel sprouts together in another bowl. 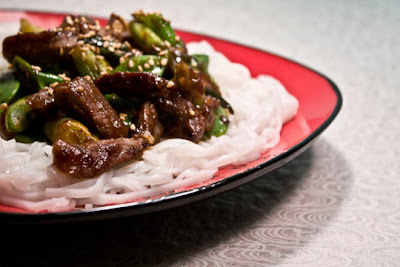 Garnish with snow peas and sesame seeds. Slice the beef into thin strips roughly 1/4 in. and slice the pepper very thinly into strips, about 1/8 - 1/16 in. thick. Heat a little oil in a pan. Add the beef and saute for about 1 min., or until the outside is no longer pink. Add the pepper and beans and saute another 1-2 min. Mix together the sake, mirin, and soy sauce (1 Tbsp. each). Add to the beef mixture. Continue to boil, stirring occasionally, until the sauce has thickened and the liquid is nearly gone. Be careful not to let the sauce burn in the pan or it will have a bitter taste. In a separate pot, bring the measured water to a boil. Add the dashi granules and 1 tsp. each soy sauce and mirin. Stir until the granules have dissolved. Thinly slice the tofu puffs, the mushrooms into 1/4 in. strips, and the spring onions on the diagonal. Add to the soup and boil for 2-3 minutes. Add the miso and stir until dissolved. Turn off the heat. 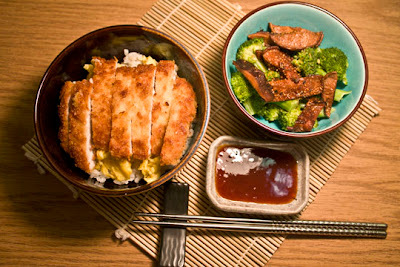 To serve, place the rice in a small bowl and sprinkle with furikake (rice seasoning) if desired. Put the beef and vegetables on a plate and sprinkle with sesame seeds. Serve the soup in a separate bowl. Don't faint! I know this isn't Asian. Hey, I never said this was an exclusively Asian food blog, even though it's what I like to cook the most. I've been passing up many kinds of large-leafy vegetables such as kale in the grocery store, always wondering what to do with them. Finally, I decided to give kale a shot. Kale is usually sold in a large bunch. It has very large crinkly leaves and very stiff stocks. I found out on the internet that you have to boil kale leaves for at least 10 minutes to soften up. They don't wilt down say, like, spinach would. It has a stronger flavor than your average lettuce, and it's very delicious. Give it a try! Cut the stalks from the kale leaves and discard. Roughly chop the kale leaves and add to the other pot of boiling water. Boil the kale for at least 10 minutes, or until the leaves are soft. Drain, then fill the pot with cold water. Put the drained kale back into the pot to stop the cooking, then drain again. Heat a dry pan over medium heat, and add the bacon. Cook until crispy, then drain the bacon on paper towels. Discard all but about 2 tsp. of the bacon grease. When the bacon is cool, crumble into pieces. Heat the bacon grease and add the minced onion and garlic. Cook until the garlic is browned and the onions are softened. Squeeze the excess liquid from the kale and add to the pan. Add the chicken stock and bring to a boil. Continue to boil until nearly all the liquid has been absorbed. Add the pasta to the pan and stir to combine. Sprinkle with herb seasoning and stir. To serve, put the pasta and kale on a plate. 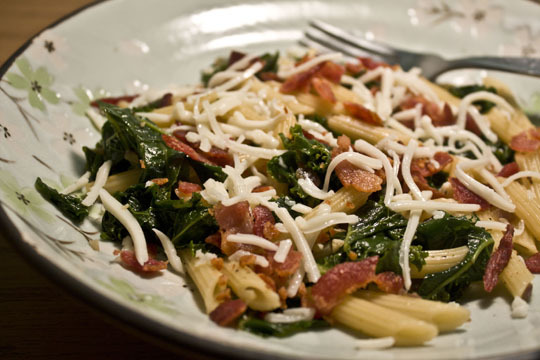 Top with bacon bits and sprinkle with cheese. In College and Actually Cook has been on hiatus, but the next semester will be starting soon! I'm back on campus, but I can't say I'm quite ready for all of the work that's about to come. My last semester! *sniffle* I don't have my "blog class" anymore, so I might not post every day, but I'll do my best to share some recipes as I get time. So please check back if you don't see something new--it just might be a little more sporadic! Best of luck to any other college peeps out there ready to start classes! Tonkatsu is really nothing more than breaded and lightly fried pork chop, usually served with shredded cabbage and a Worcestershire/soy/ketchup sauce. I made my tonkatsu the "traditional" way (OK, I'm really not sure if tonkatsu is traditional, so you'll have to ask someone who knows a little bit more about Japanese food for that one), but since I don't have any cabbage or Worcestershire sauce on hand, I decided to match it with broccoli and mushroom, and I made up a similar sauce from what I had. This is a super simple dish to make, and really doesn't require any ingredients you can't pick up at the local supermarket, save for maybe mirin. My other tip is that if you don't have a meat mallet (which you can join me in the crowd of raised hands), you can use any heavy-duty roughly-flat kitchen utensil such as a potato masher (which is what I used) or even a rolling pin.... just don't break anything in the process. After rinsing and drying the pork with a paper towel, trim any fat from the chop. Wrap a piece of plastic wrap very loosely around the pork an pound until 3/16 to 1/4 in. thickness. Unwrap the pork. Place the flour in on bowl, the egg in another, and the panko crumbs on a plate. Coat the pork with the flour and shake off the excess. Then dip in the egg until thoroughly coated. Let the excess egg drip off, then lay in the panko. Press the crumbs onto the surfaces. Cover the plate with the crumbs and pork with plastic and put in the fridge until needed. Discard the flour, but keep the egg. Add the salt and the sugar to the egg and stir until dissolved. Set aside. Cut the mushrooms into 1/2 in. strips. Set aside. Mix the ingredients for the sauce. Set aside. Remove the pork from the fridge. Heat about 2 Tbsp. oil in a pan, then add the pork. Pan-fry for 4-5 minutes, or until the bottom is nicely golden-brown. Flip the pork over and fry until golden-brown. The pork should be cooked through. Remove the pork from the pan, but do not cut yet. Add the mushrooms to the pan, and pour over with the soy sauce and mirin. The liquid should come to a froth. Stir the mushrooms until nearly all the liquid is absorbed. Remove the mushrooms from the pan. Using a paper towel, wipe the remaining soy sauce from the pan. Add a tiny bit of oil. Pour in the egg and cook scrambled until just set. Turn off the heat. To serve, put rice in the bottom of a serving bowl. Add the egg on top. Cut the pork into 1/2 in. strips and place on top of the egg. In another serving bowl, put the broccoli and top with the mushrooms. Sprinkle with shichimi togorashi. Serve with sauce.